I had my backyard dream come true today. The kids had a morning playdate outside. I left the window open and listened for any cries that seemed to indicate loss of life or limb and made dinner, cleaned up, and had it prepped in the fridge for baking that evening. All before 11am. I am in love with my new home. Our worldly possessions arrived on Friday. Well, most of them anyhow, and I unpacked the kitchen that first night. I loved knowing that I would wake up the next morning and push past the mass of boxes in my bedoom and closet to a box-free world of main living space. I could open any cabinet and find my flour, sugar, olive oil, wine glasses...and a lot of room to spare. Unpacking was like Christmas and grocery shopping all in one. Our new furniture arrived just minutes before the moving truck so in one fell swoop, our house was becoming a home. As I try to decide where to place all my favorite prints and artwork, I'm realizing that the scale of these walls is totally different. I see a fun lets-have-the-kids-do-a-giant-art-project-in-the-yard post coming up. Hopefully it turns out that I can actually hang the result on our gynormous living room wall! Taking a shower this morning, I realized that the only hitch is that the sparkly clean house we moved into would eventually have to be cleaned, and for the bathrooms, that eventuality is now. Ah well, the bliss of sparkly white porcelain couldn't last forever without intervention, right? I haven't run since the half-marathon. Yikes. However, J and I have decided to train for, and run, the first annual Walla Walla half-marathon. I love how strong I feel when I'm running consistently, and have not yet gotten to the point of no return for the land of the in-shape, so tomorrow morning I have a date with the black top. I got J's blessing to order the double Bob so that there are no excuses if we both want to go running and the kiddos aren't otherwise occupied. I can't wait for it to arrive! I had initially felt myself very small town minded when I decided to order the stroller from the local bike shop. Alas, they called this morning and said that their distributor was out of them until the end of August. Boo! As for feeling powerful when running, there have been lots of other fun benefits as well. There are many aspects of your life that are more fun when you're in shape and feel more confident about your body...but one is especially fun. Speaking of fun activities. With plans for a Baby #3 in the works around spring time, I started asking around about local OB's that will do a VBAC. To my horror, I found that the hospital here has a no VBAC policy. I was incensed, and immediately watched The Business of Being Born again, because instant play on Netflix is the best course of action, right? I am only semi-joking when I say that a home birth is not far off my radar, as I can't imagine having surgery for no reason. I contacted my Massachusetts OB, whom I love and respect very much, and he said that a home-birth was actually not a bad option if the midwife I use has rights and back-up at the hospital. My husband is a doctor, after all! He also, however, encouraged me to be very proactive in talking with the hospital and advocating for my wishes. Now, this is all assuming that once I actually talk to my OB and explain that I've already had a successful VBAC and that doesn't change everything. Get ready for one hi-larious birth story post if this wailing mama goes au naturel at home. Maybe we'd even use my sweet soaker tub and have the ultimate low-tone moaning experience of water birth. I am not making fun of home birth, or water birth for that matter. But, I know that those who know and love me are laughing at the thought. On that note, I better go drink another fabulous crisp, cool glass of local Viognier (Cougar Crest, yummy!) as my oven timer is about to beckon. I'm sitting in my new kitchen, perched atop a stool with a rug-rat at my feet who's not quite convinced this time change ever happened. We hit some snags along the journey, but the bottom line is that we're in our new home, and it's everything I hoped it would be. Save for one little detail; we have no furniture, or any of our things. Wait, you say. Didn't she just say she was perched atop a bar stool? Okay, yes, I have a card table with four folding chairs and two bar stools. But our actual possessions were last seen in Syracuse, NY and are slated to be delivered next week. In the meantime, I rounded out my trifecta of dream appliances with the Electrolux 'red hot red' front-loader washer and dryer and a monster of a french door stainless Samsung refrigerator. J and I spent the last four days building the fence that will allow me to sit on the back patio and lazily sip my coffee while the kids have the run of the yard. J's parents came from Montana to help with the fence-building process, and when Granny and Papa came to deliver the bedding I had shipped to their house, they also donated a day of labor and child-watch. I can't even begin to describe how nice it is to be close to family. Prior to Day 1 of Operation Build a Fence, I ran my second half-marathon; Fueled by Fine Wine in Dundee, Oregon. It was the most beautiful, but also the hardest course I've ever run. I was so dreading the race because I'd run exactly once since June 27th, but I'm so glad I just got over myself and did it. The course itself was a 'slow' course, which made my slow time just fine. I ran the race with my best friend and my sister-in-law. 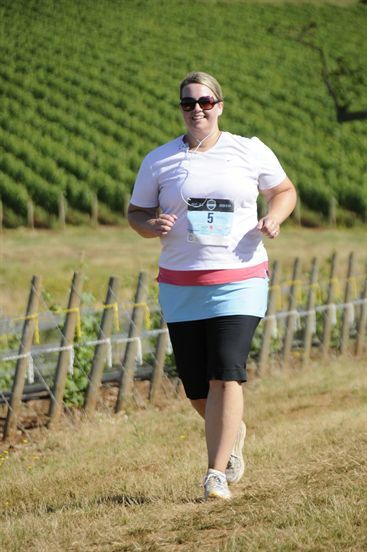 It was my friend's first half-marathon and she rocked it, I'm so proud of her! My sister-in-law ran it even though she was sick, and still had an awesome time. After two 900 gains and decreases in elevation, I was deliriously happy to see that finish line. At the end, I actually did want to sample some of the offerings and a crisp, chilled brut followed by a cold pinot noir rose never tasted so good! Lunch and a shower with my brother and sister-in-law on the East side of Portland before making the drive home were just what the doctor ordered. When we arrived back in Walla Walla, we stopped by Safeway where I picked up an assortment of cheeses, some crackers a salad...the perfect light dinner fare. We were home for about 10 minutes when the doorbell chimed and I thought 'Seriously...I'm too tired to be neighborly' but I opened the door anyway. On the stoop stood our old friends, who we hadn't seen in person since I was pregnant with Charlie. We put the kids to bed, opened a bottle of wine and sat in our back yard visiting until almost midnight. It was the perfect end to the day. On the flip-side of all of that; I miss my friends. We had a good thing going in Massachusetts, and it's just hard to start all over again. Last night was the first time H has watched TV of any kind in over four days, and it was as if the Backyardigans were the best thing since sliced bread. Today we're going to our first playdate where H will get to play with kids his own age since we left Massachusetts. He's starving for some same-age stimulation! And that's all for now because I have a toddler struggling with the sliding glass door, and the coffee has brewed. Off to enjoy the early morning sun and the beautiful fenced yard that is all my own. I'm writing this post from Iowa, which means that we are checked out from our apartment, the Skybox has been loaded back on the car and packed to the gills. As always, my spatially-challenged self mis-judged the amount of room we'd have in order to include my little sister in the trip. After about twenty hours of riding in the back seat with my kids in stereo on either side of her, she decided that she would rather pay the extra money to fly home and see her own children, rather than have mine being loud and boisterous in her ears. Overall, they've done great in the car, but by the time we were about ten miles out of Iowa City H was in tears asking if we were ever going to get there?! He said he'd 'rather go to Tyler's house' because it was closer...little did he know we were over 20 hours from Tyler's house. Leaving was a lot harder than I expected. Three years is a long time to put down roots, make connections and create a life for yourself and your family. J didn't struggle as much as I because while he worked in Worcester, I lived there. My friends are all staying, and will be meeting for coffee club, beach playdates and mom's night outs, minus one Sally HP. J is within a cohort of people that are all moving to the next step.